Most weddings at the resort are held on a Saturday which is my day off so I seldom see the final look of the decorated cake. 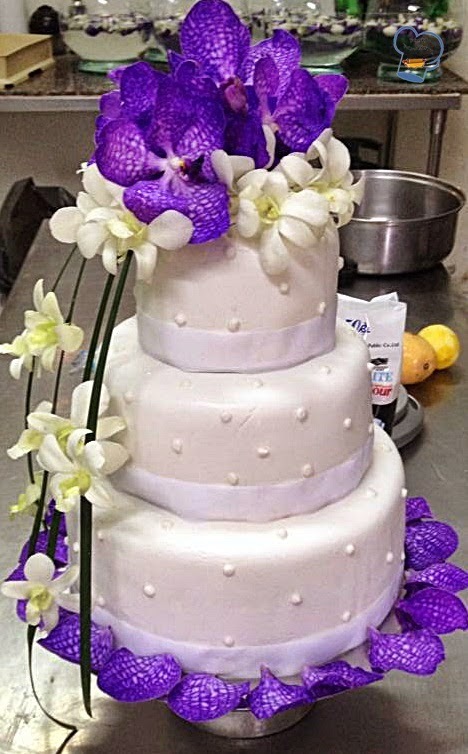 Thanks to my boss who is kind enough to share the picture of this cake for the wedding on Saturday. This is my fifth chocolate cake this year. Pardon the background. I tried to paint it black but couldn't do it right so I would leave this photo as it is. Khun Muek, the resort's florist did a wonderful job with the flower arrangement. It looked stunningly beautiful. I jokingly said he and I could team up and start our cake business. There are only a couple bake shops here and the demands are endless. I think in a couple years time, I would be able to hone my cake decorating skills and we could compete with the bakers from around the island. Well, just a thought. More pictures of the cake without the flower accent to follow. I used the cake topper which the other couple left for picture purposes.